Good combination of sweet figs (I used black mission) and the peppery arugula. The beets and the arugula were delicious separately, but the dish did not come together for me. The taste of the horseradish was lost, as well. A very easy to prepare soup that is more than a sum of its parts. The kiddo went back for seconds. Very tasty. Good, and easy (although I can't buy shelled shrimp, which would certainly make it more easy) -- */but/* what in the world are Rogers & Gray thinking of, calling for canned chickpeas? Yuck! It doesn't make anything all that much harder to start the day before, bring dried chickpeas up to a boil, simmer them for five minutes, cover them, and let them sit overnight. They are so so so much better than those tasty, pasty chickpeas in a can. p. 81 - simple rec calls for 4 Italian sausages, home made sauce, approx 1/2cup ricotta - intention is that "hot/spicy" Italian sausages be used, even though this is not stipulated in the actual recipe...description describes dish as "spicy" but no such seasoning added. May 2010 - first use of this recipe and I was pleased w the results. The heat in the recipe comes exclusively from the Italian sausages so be sure to taste in advance. Some found this dish a bit too spicy, even w the ricotta. Rec. instructions fail to note the addition of garlic (s/b added w onion and fennel). I chopped both fine using food processor and would do so again for a smoother sauce. I used my own marinara rec for tomato sauce and needed more than called for due to the size of my fennel bulb. Uses approx 1.5c sauce and was pleased w results. Good for company as prep can be done ahead. Overall, this is a keeper. 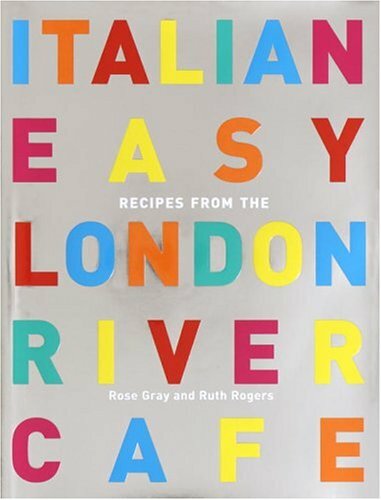 The food world superstars behind London's wildly popular River Cafe are back with their fifth cookbook--a number-one nonfiction best seller in the UK--this time featuring Italian home cooking recipes that are so flavorful, you won't believe how easy they are to prepare. River Cafe founders Rose Gray and Ruth Rogers have been hailed by critics for their innovative approach to Italian food, which they demonstrated gloriously in 4 highly successful cookbooks, Now, they have compiled a superb collection of recipes for everyone whose love of fabulous food is often frustrated by the lack of time. Displaying the imagination and panache that are Rose and Ruth's hallmarks, these remarkably easy recipes are assembled with just a handful of ingredients and even fewer steps. Tuna Carpaccio with Capers and Arugula; Tagliatelle with figs, Chili, and Cream; and Roast Quail with Salt and Sage are as simple to prepare as they are enticing. Each recipe, illustrated with a gorgeous photograph, highlights the fresh produce you will need to shop for, as well as the ingredients that are pantry essentials. Twenty categories--from bruschetta and antipasti, through seafood, veal, lamb, and pork, to chocolate cakes and ice cream--provide an inexhaustible array of meal-planning ideas for cooks of all skill levels.